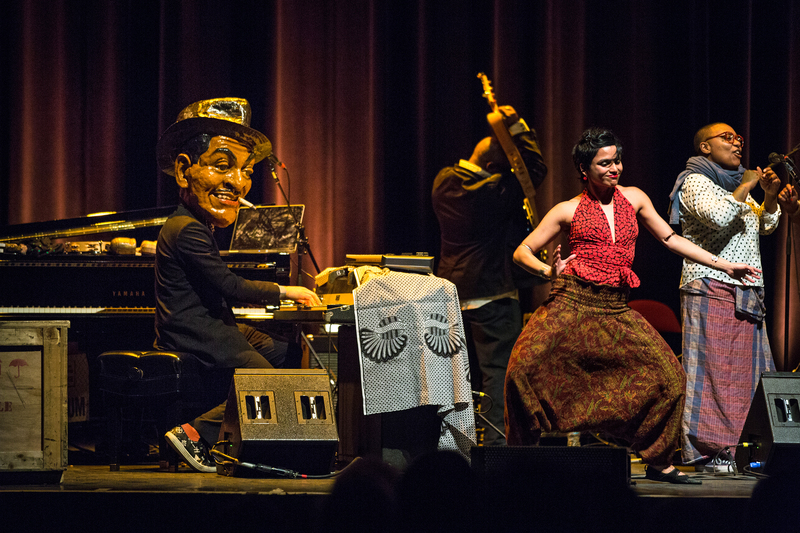 Jason Moran in his Fats Waller mask, with dancer Pampi and singer Meshell Ndegeocello, far right. Photo by Robert Torres for the Celebrity Series of Boston. It’s impossible to overstate how powerful masks can be. Here’s Jason Moran in his Fats Waller mask, designed by Didier Civil. “This mask is hot!” Moran said after removing it at about the mid-point of his Friday night Celebrity Series of Boston concert, “Fats Waller Dance Party.” You can read my Boston Globe review here. But I hardly had room to talk about that mask — oversized, expressive, it became the identity of the usually soft-spoken and understated Moran. When that big bobble head Fats Waller turned to look at the audience, you believed it. After removing the mask (he said he’s worn it in about 30 performances, and it’s getting a little ripe), Moran put it back on to finish the show. By the way, the excellent dancers were recruited locally and asked to improvise through the show — which they did impressively: Pampi, Jenaya Dailey, and Jon Shaw-Mays. This entry was posted in Thinking Out Loud and tagged Berklee Performance Center, Celebrity Series of Boston, Fats Waller, Jason Moran on April 7, 2014 by jongarelick. Vijay Iyer and Robert Pinsky at Sanders Theatre Friday night. Photo by Robert Torres. Courtesy of Celebrity Series of Boston. I was only able to hear a portion of the Vijay Iyer/Robert Pinsky Celebrity Series of Boston concert at Sanders Theatre Friday night — all of Iyer and Pinsky’s 40-minute “PoemJazz” set, and about 45 minutes of the Vijay Iyer Trio set. Nonethless, a fan I became — of Pinsky and of PoemJazz — after seeing that Regattabar show with pianist Laurence Hobgood (who has recorded PoemJazz with Pinsky). 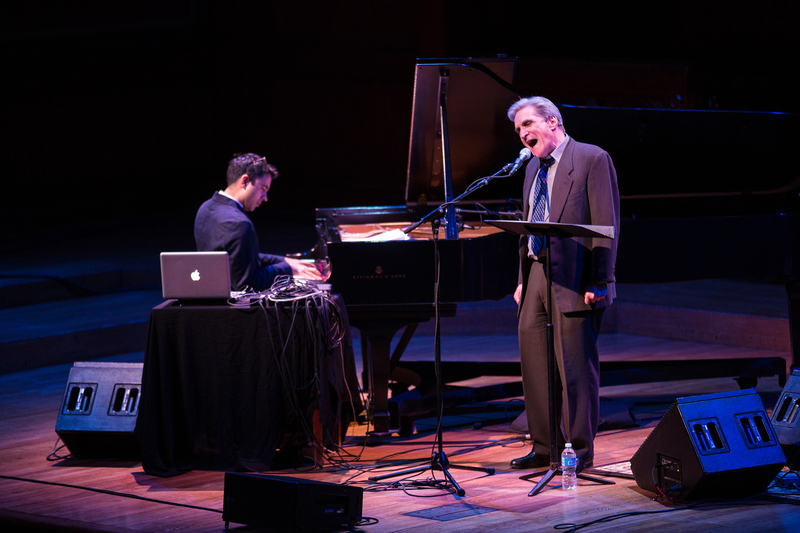 For PoemJazz, Pinsky wasn’t looking for impressionistic musical responses to his texts. He wanted to perform the poems as true musical duets (he is a former aspiring jazz saxophonist). The text of the poem become a lead sheet, and Hobgood told me he reads ahead as he listens to Pinsky’s words, devising chord sequences. 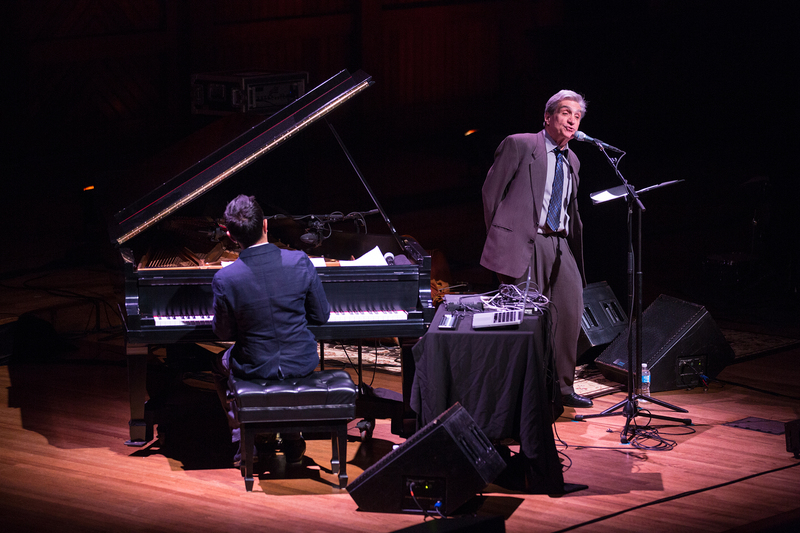 There are piano introductions, cued entrances and exits, piano solos (breaks for a bar or two or sometimes the equivalent of a chorus or half-chorus), and Pinsky fiddles with his own texts, using repetition as a song-like device. Poetic form becomes musical form in these performances. Robert Pinsky in full yawp. Photo by Robert Torres. Courtesy of Celebrity Series of Boston. I can’t comment fully on Iyer’s performance with his trio because, like I say, I heard only a portion of it. Iyer, bassist Stephan Crump, and drummer Marcus Gilmore played beautifully, avoiding any obvious grooves or straight meters. There was one lovely ballad that sounded as though it might turn into “Misty” but didn’t. The forms were odd, too, with Crump sometimes holding things down with recurring short patterns, the band falling into cadence and unison lines at unpredictable points. I was most struck by an old-fashioned “process” piece — of the likes of Reich or Glass or maybe Feldman — that built layers of repetitive rhythmic patterns and a continually rising crescendo over the course of (by my count) nearly 15 minutes, coming to a hard-stop climax with a mighty thwack from Gilmore. It got a huge ovation from the crowd. Iyer said it was called “Hood” for the electronic musician Robert Hood. About midway through the 45 minutes that I heard, I grew a bit restless, as all the odd-metered hooh-hah began to take on a sameness. I recalled years ago seeing Brad Mehldau’s great trio with bassist Larry Grenadier and Jorge Rossy at Jordan Hall. I invited a friend to join me — someone who had been a huge Mehldau fan. But he said he’d been feeing emotionally disengaged from Mehldau’s playing lately — all the complex odd and mixed meters, he told me. But he joined me anyway and, lo and behold, Mehldau played some straight-time swing, a bolero (by Charlie Haden), a couple of waltzes. Jazz these days — from Mehldau and Robert Glasper to Mary Halvorson and Taylor Ho Bynum — is pursuing new paths in rhythmic invention. And some of it really does groove in a beautifully fucked-up way (catch Glasper live with the drummers Mark Colenburg or Chris Dave or Rudresh Mahanthappa with bassist Rich Brown). I think in live performance more than on record you really do need some groove, if only for the sake of variety and a bit of ear-refreshment. In any case, I’d love to hear from anyone who caught the rest of the Iyer trio’s performance after “Hood.” Iyer announced that he was about to play a solo piece when I left. What else did he and the band play? And, by the way, my exit had nothing to do with my feelings about the performance. Sometimes there are just other places you have to be. POST SCRIPT: A set list from Iyer’s management (via the Celebrity Series) indicates that Iyer followed “Hood” with a solo piano performance of Billy Strayhorn’s “Blood Count.” Too bad I missed that one, would have loved to have heard it. And Pinsky returned for a performance of his poem “Ginza Samba” (“A monosyllabic European called Sax/Invents a horn. . . . “). This entry was posted in Music Diary and tagged Celebrity Series of Boston, jazz, Marcus Gilmore, Robert Pinsky, Sanders Theatre, Stephan Crump, Vijay Iyer on March 17, 2014 by jongarelick.